Vegan & gluten-free sweet potato, new peas & smoked tofu burgers! Divine gourmet vegan & gf sweet potato, new fresh peas & smoked tofu burger! Yum! Divine, tasty & truly fab vegan & gf burger! 🙂 Happy eating! 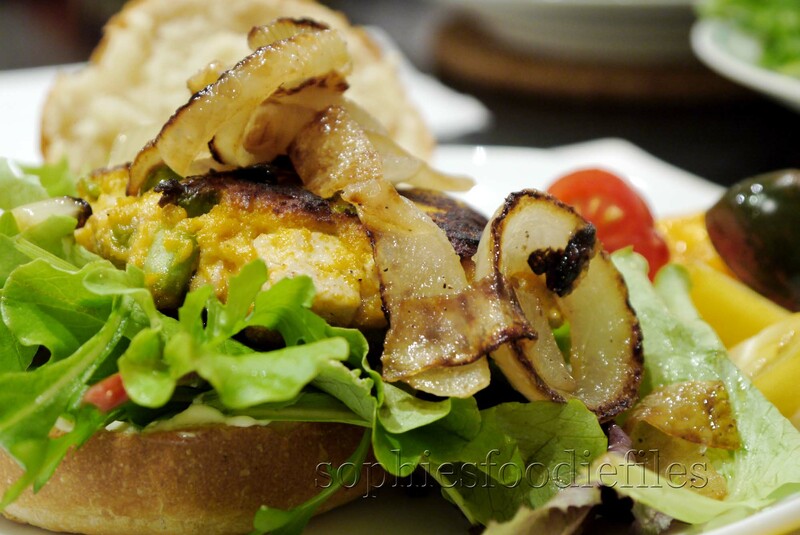 Yesterday, I made these tasty invented sweet potato, new peas & smoked tofu burgers. I made them gluten-free too! I didn’t use any water because there was still some water left in the just cooked sweet potatoes. ** To serve: Gf buns or normal dinner rolls, some mixed lettuce leaves, some mayonnaise, colourful mixed cherry tomatoes, cut into 2, 2 fat white onions, peeled & cut into rings. 1. First, cook the sweet potato chunks in salted boiling water until tender. I used spiced sea salt. Drain well. Set aside. Mash them with a fork. 2. In the meantime, cook the fresh podded peas in salted boiling water until al dente. Drain well. Add to the potatoes. 3. In a large bowl, add the cooked sweet potatoes, the cooked peas & the smoked tofu chunks. Mix well with a spoon. Now, add the garlic powder, the grinned black pepper & the sea salt flakes. Mix well with a spoon. Now, add the Gf breadcrumbs. Mix. Add 2 tablespoons of the quinoa flour. Mix well. If you see that you need an extra tablespoon of flour, add it. I added 2 extra tablespoons so that I had 4 tablespoons of the flour in it. Mix well & taste. It has to taste fab. You can really taste the smoked tofu & the flavourings make it just right. You don’t want to overpower the flavour of the freshly cooked peas. You must taste them too! 🙂 With wet hands, shape 6 burgers out of the mix. The burgers will still be a bit breakable. I placed them on a clean plate & placed cling film over them. I put them in the fridge for about 1 to 2 hours to, stiff up a bit. You need to do that. They will be firmer. 4. Just before serving & frying the burgers, heat up a large non-stick pan on higher heat. Add 2 or 3 tablespoons of a fruity EVOO. When hot, add the onion rings & fry until tender & browned all on both sides. Season with sea salt & black pepper. Set aside & keep warm. Now, add some of that fruity EVOO & add some vegan baking margarine. When hot & sizzling, add 4 burgers to the hot pan. Fry on both sides until browned on all sides & warmed up. This will take a few minutes on each side. Keep warm. Let it rest for a few minutes. Previous Post Sophie’s vegan cheddary cheese spread! Ooh yeah! Those tomatoes are GORGEOUS!! 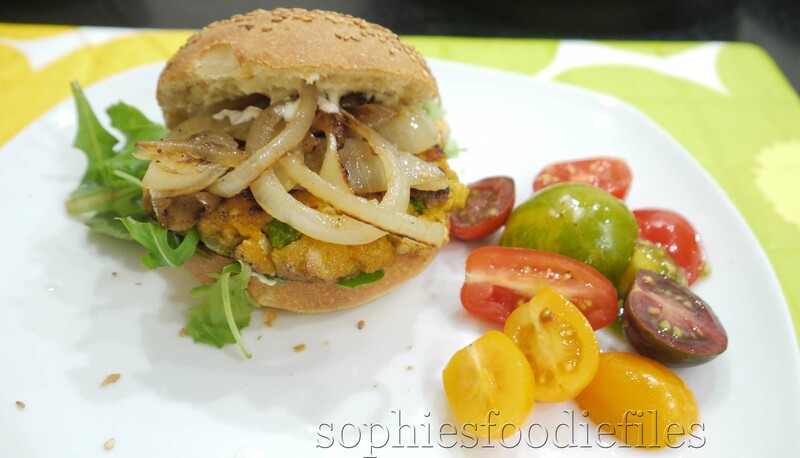 I love fried onions on my burgers…these look great Sophie! I like how they are gluten free! The quinoa flour packs a healthy punch! Great garnish ideas, especially the new peas! Thanks, Valerie! 🙂 Enjoy them! The onions make this one look extra delicious to me! I’d like to dip into this colourful, very inviting dish! Great combo, sweet potato and smoked tofu. Interesting that you use both breadcrumbs and flour instead of one or the other. Sophie – what an inventive dish indeed! I love the colorful tomatoes – can’t wait for tomato season! And yes, these are so healthy too! , full of protein! Thank you for checking out my blog Sophie! These burgers look freaking delicious. Like straight out of a restaurant. I will definitely be checking out your blog more often!!! You are welcome, Vanessa! 🙂 You have a cool blog! 🙂 Thanks so much! Wow !! Wow you have done such a fabulous work , these burgers looks lip smacking and exotic..
Yeahh! I am so happy that you love them too! Enjoy!